Welcome to Mid-Week Mixers. Don’t put away the green tablecloth just yet, we’re still celebrating Saint Patrick’s Day. 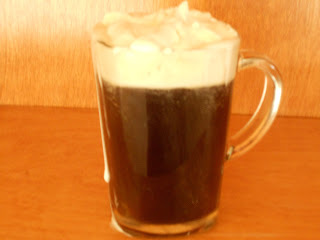 Only here at Word Wit and Wisdom, Naomi Blackburn is showing us the Irish heritage of hearty food and soul-satisfying drinks…Could she possibly forget everybody’s favorite – Irish Coffee? I think not. guess it could be done, but with 6 ounces of coffee per cup, I would drink that in one gulp!! So, here we go! 1) Place all ingredients in a saucepan and allow to simmer. DO NOT BOIL!! 1) Whip the whipping cream. Once stiff, add the sugar and whiskey. Then: Pour coffee mixture into cup and top with spiked whipped cream. ← Another Day, Another Winner!